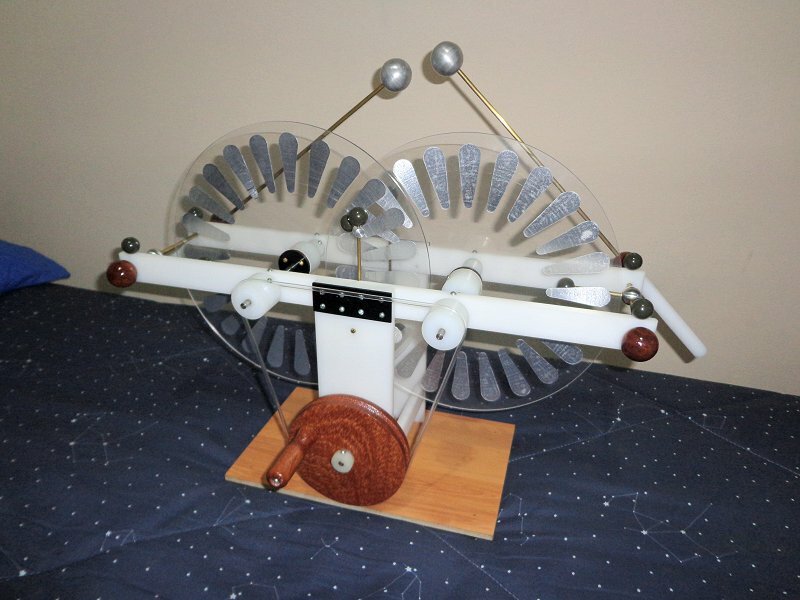 A Bigger "Half Wimshurst Machine"
In January 2014 I completed a bigger version of the "half Wimshurst machine". It has two 29.5 cm disks of transparent acrylic with 24 sectors of aluminum tape in each. The structure was made with white HDPE plates with 9 mm of thickness, over a simple base made with a floor MDF board. As in the other machine, it has a single Wimshurst-type charge separation structure, in the area where the disks overlap. Two interconnected neutralizer brushes there touch the sectors in the opposite disks, one close to the top of the overlap and another close to the bottom. The disks rotate so a disk first touches a brush in the overlapping area and then serves as inductor for the other disk touching the other brush. Charges are collected at the horizontal extremes of the disks by sets of sharp wires mounted in rods connected to the terminals. Another view. Note the position of the upper neutralizer brush, touching the disk as far from the edge as possible. The other brush also touches the other disk in this way. This apparently maximizes the output voltage. the machine works practically in the same way of the smaller machine, reverting polarity at each few turns of the disks, and not reaching very high voltage before the reversals. With the terminals shown (3.4 cm spheres) it reaches 6 cm sparks, more or less depending on the separation of the disks and the position of the neutralizer brushes. The polarity reversals allow the machine to be used in applications were a true DC machine would not work. 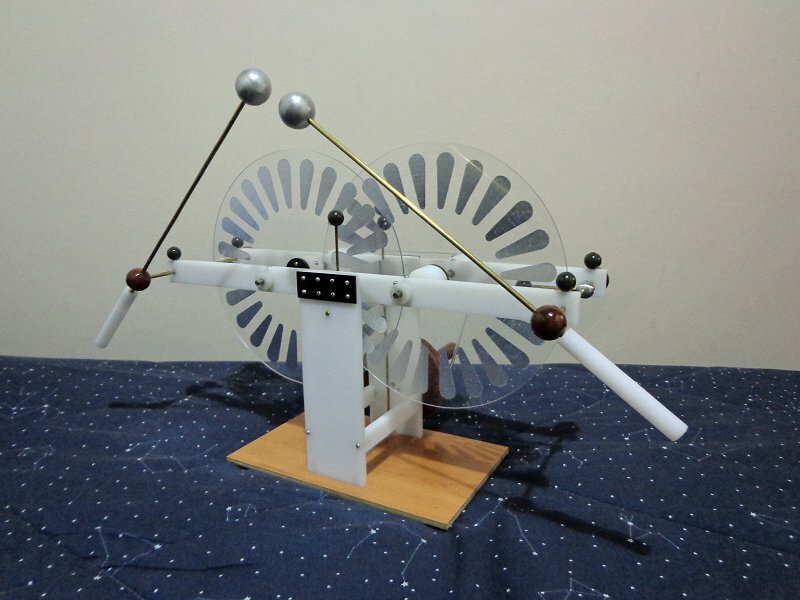 The videos below show the machine connected to "hailstorm boxes" without ground connection, and powering a device that makes a light ball rotate around an insulated metal ring. The choice of the materials was not very good. The structure in HDPE could be more solid, and the base heavier. I will probably make some improvements in the machine yet. This machine will serve as a test machine to see if there is a way to eliminate the polarity reversals.